This is such a simple and tasty dish. If you've had a stressful day, then this is a lovely relaxing dish to cook - just stand and stir as the rice turns creamy. If you like, add a splash of white wine to the rice and allow to bubble before you start adding the stock. 1. Pour the stock into a wide saucepan and add in the salmon fillets. Simmer gently for 8–10 minutes until cooked through, then lift out the fish and transfer to a plate, reserving the stock in the pan. 1 minute. Ladle in a third of the reserved stock and cook, stirring until it absorbs the liquid. Continue to cook and add the remaining stock, stirring regularly until the stock has been absorbed and the rice is tender — this should take about 20 minutes. 3. Remove from the heat and stir in the parsley leaves and stalks, the lemon zest and juice, butter and cheese. 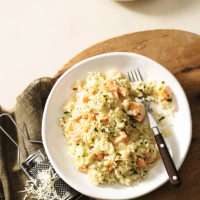 Break the salmon into large flakes and carefully fold through the risotto. Divide between bowls and serve with extra cheese and a good grinding of black pepper.